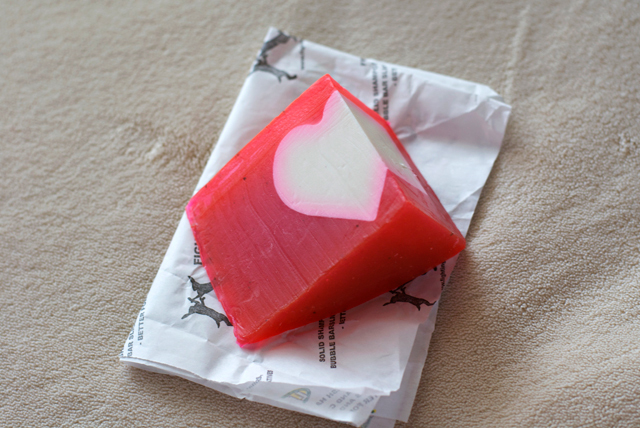 ... and rubbing his back with the "Cupid's Love" soap which smells of citrusy bergamot and hides a white heart. 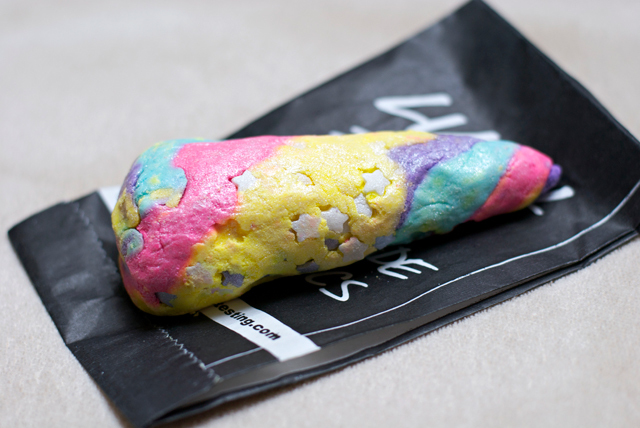 And if you're spending Valentine's Day all alone you can just take a pampering bath with the sparkly "Unicorn Horn" for the extra pastel flash and a bathtub full of stars. Of course Lush has got more products to offer, which you can all find on their web page. However there is one which I absolutely have to mention because it's just so mind-blowingly Lush-y! It's the "Love Locket", a bath bomb in the shape of a heart, that covers a smaller heart inside, which again sets free hundreds of tiny pink hearts and glitter. It is the ultimate Valentine's kitsch but I love it! 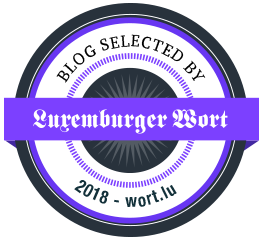 As for the blog party it was just so much fun! First of all we were served the "Prince Charming" cocktail which has been inspired by the same named shower gel and thus contains pomegranate juice and a little rum for the fun! Throughout the evening we were also served nibbles and tiny desserts by the most charming and hilarious waiter. 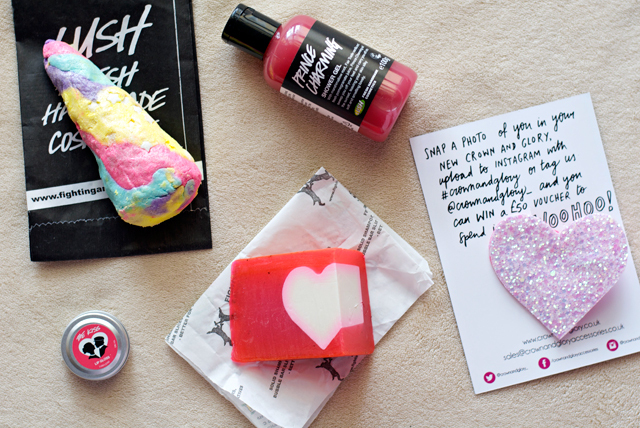 The whole Lush team was attentive and lovely as always and we were introduced to the Lush values and the whole Valentine's collection which we could try out. That meant lots of foam and glitter and fun. Throughout the whole evening one of the staff members was taking pictures of us with a polaroid camera and they even had a flower crown and a unicorn hat to make the pics even more funny. Just like at the Blogger Breakfast we were allowed to make our own Lush product to take home. This time we mashed up the "Catastrophe Cosmetic" face mask which contains fresh blueberries. I applied it the other morning and this super duper fresh goodness just felt amazing on my skin and left it all clean, soft and radiant. I don't think I will ever stop using that face mask! So thousand thanks to the staff of the Lush store Luxembourg and the responsible press agents! P.S. 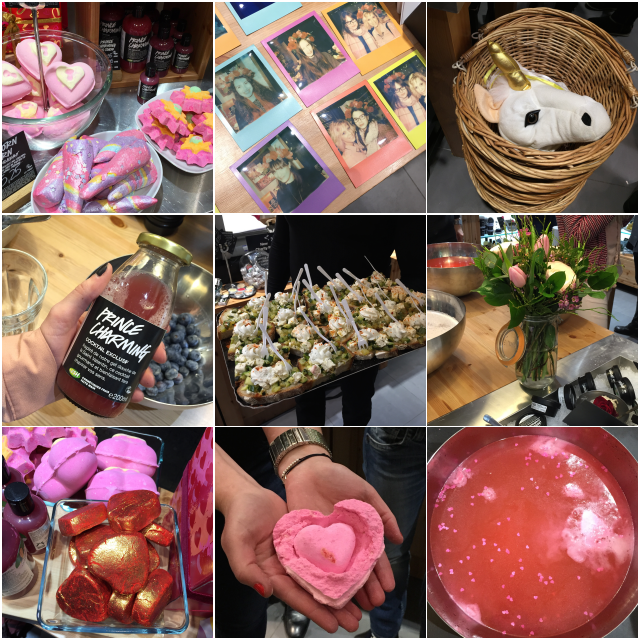 : You can find more pictures of the event by browsing the hashtag #lushblogparty on Instagram. Oh wow, that unicorn horn and all the other colorful bars! How fun and pretty! I would love if they all came in mini sizes so I could collect them! I love that they made a drink that surrounded the product! Omgosh, I want to try that unicorn horn - it looks amazing!